A huge carving of a white horse on a wildlife site in Kent is illegal, says the European Commission. It is understood to have issued a formal notice to the UK Government for giving the go ahead to the white horse on a hillside near Folkestone. The intervention of the EC came after complaints by Friends of the Earth and the Green Party that the work was damaging one of Europe's most important wildlife sites. But the artist who designed the horse has denied claims it will adversely affect wildlife or rare orchids - and says the site will be a sanctuary for butterflies. Charles Newington, from Lympne, believes the horse has been hijacked by environmental campaigners hoping to set a legal precedent for other cases. He said: "We are talking about effectively a garden path, 460 yards long - end of story. "Everything has been removed already - it's been dug up and each sod has been carefully transplanted to an area above the horse. "It's due to be completed in two weeks' time and it will be - we are not going to let this kind of nonsense stop us." Green Party councillor, Klaus Armstrong-Braun, informed of the news by letter, said: "I'm delighted that the European Commission has upheld my complaint." Friends of the Earth claim it could lead to the case going to the European Court of Justice and the government being fined. The row could even set a precedent for future European challenges over proposed roads, ports and airports on or near Europe's wildlife sites. 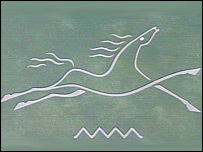 The horse was commissioned on the Site of Special Scientific Interest to mark the millennium despite objections from English Nature, Friends of the Earth, the Kent Wildlife Trust and other wildlife organisations. The groups feared the completion of the horse would allow the government to "run roughshod" over European rules on building roads on wildlife sites in the future. "We hope Brussels will demand the removal of the Folkestone White Horse and full restoration of this precious habitat," said Craig Bennett, of Friends of the Earth. "In the meantime, English Nature must seek an injunction to stop construction of this damaging beast, on the basis that it is an illegal activity." However, last week councillors in Folkestone, who support the project, said they did not believe Europe had any right to stop them. The horse was the subject of a public inquiry in 2001 and the then secretary of state Stephen Byers ruled the project could go ahead. Landowner Richard Beaugie, who owns the land on which it is being built, said he hoped it could be completed. "This is an English horse for the people of Kent and I'm not letting anyone from Brussels tell us what to do with our horse," he said. Local Conservative councillor Rory Love said last week: "We shouldn't be kowtowing to Europe on this, we've had a public inquiry and we've gone through the proper channels." Friends of the Earth says it hopes Europe's intervention will have an impact on future building on nature sites including a proposed super-port at Dibden Bay near Southampton. "If the government thinks it can get away with ignoring European wildlife law, it will allow our precious wildlife sites to be replaced with ports, airports and roads," said Mr Bennett. "The government has two months to explain itself or rectify the situation"